Stunning mix of feathers and chiffon in this gorgeous Peacock print evening dress! Dramatic sweeps of champagne over sapphire are pleated to create a gorgeous gown that is covered in beaded peacock feathers. Shown in Champagne / Sapphire. 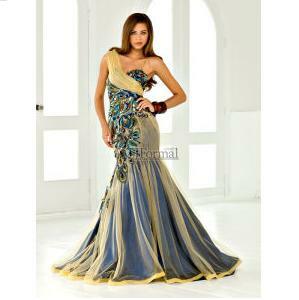 For image details, click “Buy Now”Stunning mix of feathers and chiffon in this gorgeous Peacock print evening dress! Dramatic sweeps of champagne over sapphire are pleated to create a gorgeous gown that is covered in beaded peacock feathers. Shown in Champagne / SapphireStunning mix of feathers and chiffon in this gorgeous Peacock print evening dress! Dramatic sweeps of champagne over sapphire are pleated to create a gorgeous gown that is covered in beaded peacock feathers. Shown in Champagne / Sapphire.